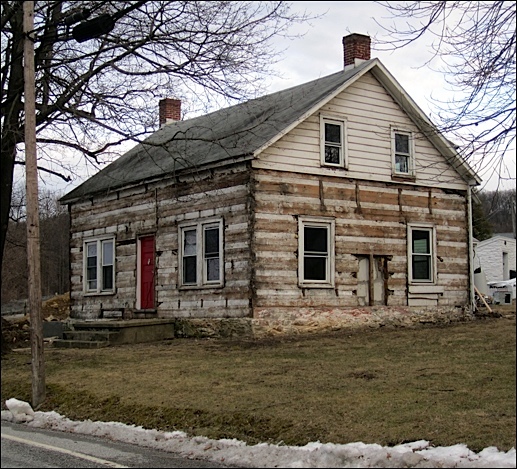 A log house IS NOT being torn down in Springettsbury Township. That structure, the home of blacksmith Henry Drayer during 1860, is being renovated. After seeing the siding removed from the log structure, several people have expressed their concern; thinking that might be a forerunner to demolition. 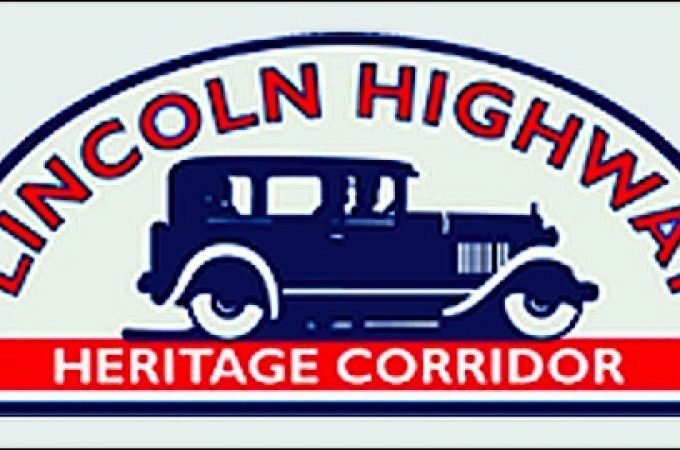 Be assured, the owner is planning a well-done historic renovation. Please respect their private property and only observe the renovation of the structure from the roads; as I’ve done with these photos. 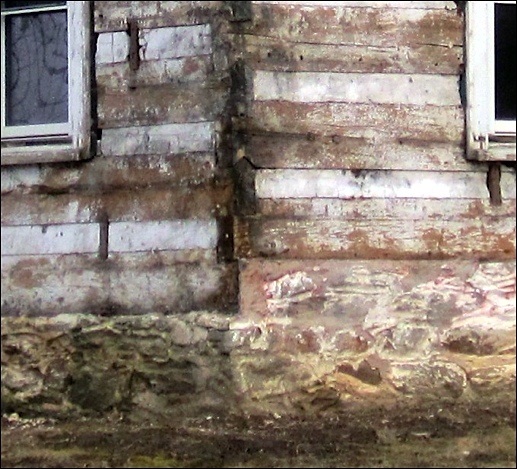 In the following photo, I’ve zooming in on the northwest end of the log house. 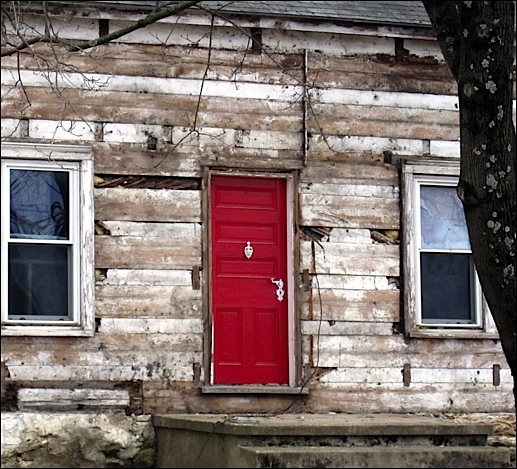 The V-Notch log construction technique is utilized; a method common in the 1700s and 1800s. The following photo shows the front of the log house. That side of the house faces Druck Valley Road. The family of Henry Drayer lived in the log house during 1860. He was a Master Blacksmith and conducted a Blacksmith Shop at that corner of Mt. 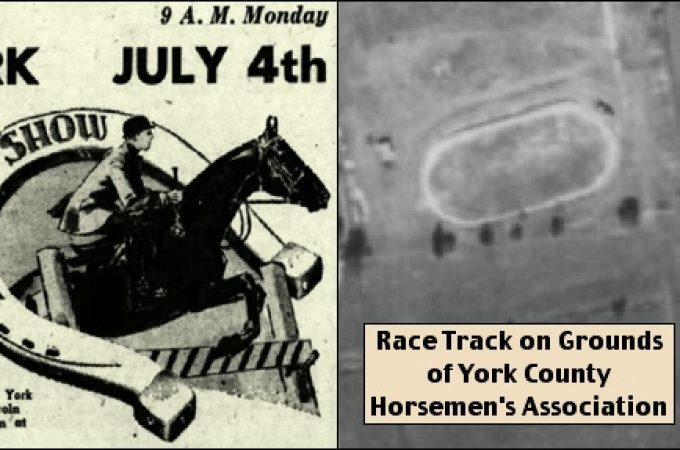 Zion Road and Druck Valley Road, when that property was within Spring Garden Township. In the following section of Shearer’s 1860 Map of York County, I’ve pointed out, and marked, seven 1860 buildings in the Mt. Zion & Druck Valley Road Area within what was then Spring Garden Township; and, as of 1891, Springettsbury Township. 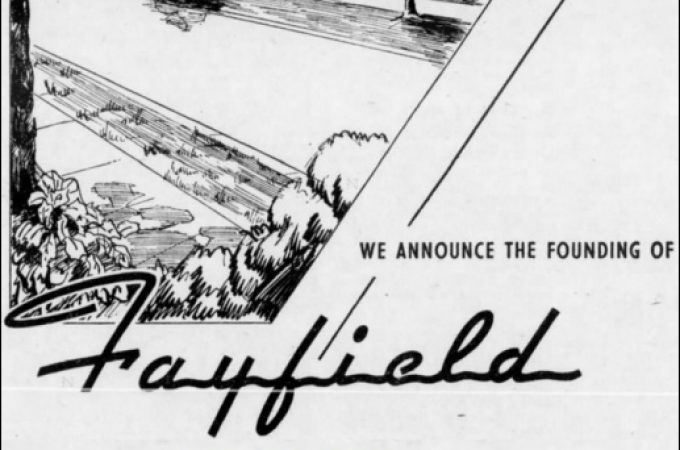 At the bottom of the illustration is a 1937 aerial photo of the same region. 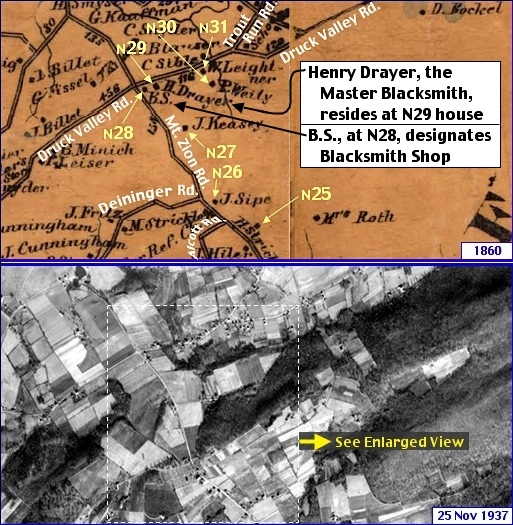 Henry Drayer, the Master Blacksmith, resides at the house, marked N29. 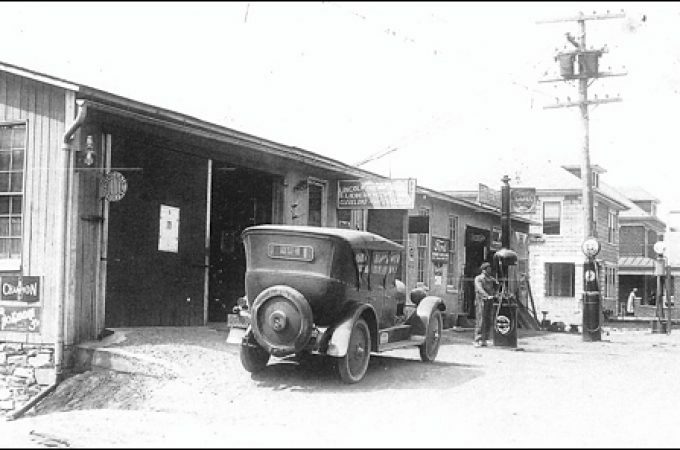 ‘B.S.’, at N28, designates Blacksmith Shop; located somewhere near the intersection of the roads. 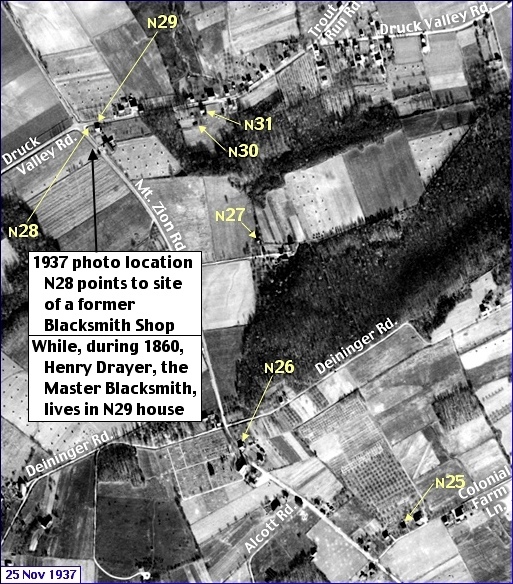 In the following view, I’ve zoomed in on the 1937 aerial photo to provide better detail in locating the 1860 properties; i.e. 77-years later. In 1937, there appear to be no remains of the Blacksmith Shop. When the 1860 map was drawn, the ‘B.S.’ at the corner; may have been symbolic that the Blacksmith Shop was near the corner; possibly in the nearby structures, still standing to the south of the log house. Henry Drayer was born in Manchester Township on February 22, 1819. He married Mary Welty, the daughter of Philip Welty and Catharine Knaub. They had two children: daughter Lucinda Drayer was born August 26, 1846 and son Henry Drayer, Jr. was born September 17, 1850. 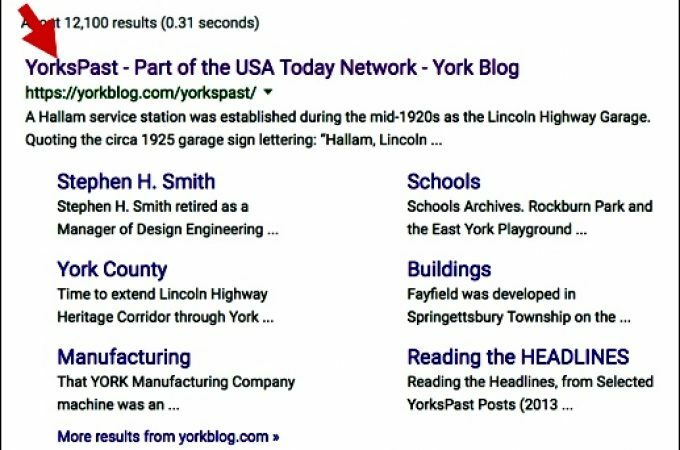 In the 1850 U.S. Census, Henry Drayer is listed as a Blacksmith in Manchester Township, York County, PA. The 1860 U.S. Census record for Henry Drayer, i.e. when his family resided at the log house, is provided in the following image of the original records via Ancestry.com. Henry’s wife Mary occasionally shows up in records as Polly; i.e. her nickname. From January 8, 1864 until July 13, 1865, Henry Drayer served with the Pennsylvania Volunteers during the Civil War. Henry served in Company A of the 181st Regiment. By the 1870 U.S. Census, Henry has retired at the age of 51. In that census his occupation is recorded as ‘Retired Blacksmith’ and his family is living in Mt. Wolf. 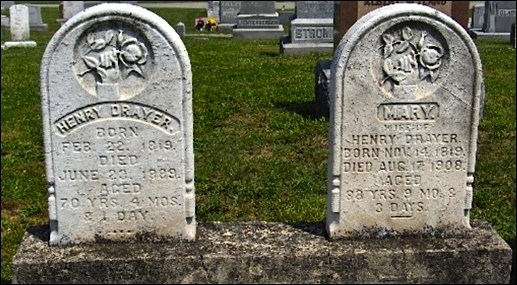 Henry Drayer died in 1889 and his wife died in 1908; they are buried in Manchester Union Cemetery.